Delirium, or acute confusional state, is an organically caused decline from a previously attained baseline level of cognitive function. It is typified by fluctuating course, attentional deficits and generalized severe disorganization of behavior. It typically involves other cognitive deficits, changes in arousal (hyperactive, hypoactive, or mixed), perceptual deficits, altered sleep-wake cycle, and psychotic features such as hallucinations and delusions. Delirium itself is not a disease, but rather a clinical syndrome (a set of symptoms). It may result from an underlying disease, over-consumption of alcohol, from drugs administered during treatment of a disease, withdrawal from drugs or from any number of health factors. Delirium may be difficult to diagnose without the proper establishment of the baseline mental function of a patient. Delirium may be caused by a disease process outside the brain that nonetheless affects the brain, such as infection (urinary tract infection, pneumonia) or drug effects, particularly anticholinergics or other CNS depressants (benzodiazepines and opioids). Although hallucinations and delusions are sometimes present in delirium, these are not required for the diagnosis, and the symptoms of delirium are clinically distinct from those induced by psychosis or hallucinogens (with the exception of deliriants.) Delirium must by definition be caused by an organic process, i.e., a physically identifiable structural, functional, or chemical problem in the brain (see organic brain syndrome), and thus, fluctuations of mentation due to changes in purely psychiatric processes or diseases, such as sudden psychosis from schizophrenia or bipolar disorder, are (by definition) not termed delirium. Like its components (inability to focus attention, mental confusion and various impairments in awareness and temporal and spatial orientation), delirium is the common manifestation of new organic brain dysfunction (for any reason). Delirium requires both a sudden change in mentation, and an organic cause for this. Thus, without careful assessment and history, delirium can easily be confused with a number of psychiatric disorders or long term organic brain syndromes, because many of the signs and symptoms of delirium are conditions also present in dementia, depression, and psychosis. Delirium may newly appear on a background of mental illness, baseline intellectual disability, or dementia, without being due to any of these problems. Treatment of delirium requires treating the underlying cause, and multi-component interventions are thought to be most effective. In some cases, temporary or palliative or symptomatic treatments are used to comfort the person or to allow other care (for example, a person who, without understanding, is trying to pull out a ventilation tube that is required for survival). Delirium is probably the single most common acute disorder affecting adults in general hospitals. It affects 10-20% of all hospitalized adults, and 30-40% of elderly who are hospitalized and up to 80% of those in ICU. Among those requiring critical care, delirium is a risk for death within the next year. Antipsychotics are not supported for the treatment or prevention of delirium among those who are in hospital. However, when delirium is caused by alcohol or sedative hypnotic withdrawal, benzodiazepines are typically used. Delirium is a syndrome encompassing an array of neuropsychiatric symptoms, including a disturbance in consciousness/attention and cognition that develops acutely and tends to fluctuate. The change in cognition (memory deficit, disorientation, language disturbance) or the development of a disturbance, must be one that is not better accounted for by a pre-existing, established, or evolving dementia. Other symptoms can include disorientation, thought disorder, memory problems, language disorder, sleep disturbance, delusions, mood lability, psychomotor changes (changes in rate of activity/movement), and hallucinations. It is unclear if the medication donepezil, a cholinesterase inhibitor, reduces delirium following surgery. There is also no clear evidence to suggest that citicoline, Methylprednisolone, or antipsychotic medications prevent delirium. Treatment of delirium involves two main strategies: first, treatment of the underlying presumed acute cause or causes; secondly, optimising conditions for the brain. This involves ensuring that the person with delirium has adequate oxygenation, hydration, nutrition, and normal levels of metabolites, that drug effects are minimised, constipation treated, pain treated, and so on. Detection and management of mental stress is also important. Therefore, the traditional concept that the treatment of delirium is 'treat the cause' is not adequate; people with delirium require a highly detailed and expert analysis of all the factors which might be disrupting brain function. Non medication treatments are the first measure in delirium, unless there is severe agitation that places the person at risk of harming oneself or others. Avoiding unnecessary movement, involving family members, having recognizable faces at the bedside, having means of orientation available (such as a clock and a calendar) may be sufficient in stabilizing the situation. If this is insufficient, verbal and non-verbal de-escalation techniques may be required to offer reassurances and calm the person experiencing delirium. Only if this fails, or if de-escalation techniques are inappropriate, is pharmacological treatment indicated. “The T-A-DA method (tolerate, anticipate, don't agitate)” can be an effective management technique for older people with delirium. All unnecessary attachments are removed (IVs, catheters, NG tubes) which allows for greater mobility. Patient behavior is tolerated even if it is not considered normal as long as it does not put the patient or other people in danger. This technique requires that patients are isolated in a specific area designated for patients of old age dealing with symptoms of delirium. Patient behavior is anticipated so care givers can plan required care. Patients are treated to reduce agitation. Reducing agitation may mean that patients are not reoriented if reorientation causes agitation. The treatment for delirium with medications depends on its cause. Antipsychotics, particularly haloperidol, are the most commonly used drugs for delirium and the most studied. Evidence is weaker for the atypical antipsychotics, such as risperidone, olanzapine and quetiapine. British professional guidelines by the National Institute for Health and Clinical Excellence advise haloperidol or olanzapine. Antipsychotics however not supported for the treatment or prevention of delirium among those who are in hospital. The highest rates of delirium (often 50% to 75% of people) is seen among those who are critically ill in the intensive care unit (ICU) As a result this was referred to as "ICU psychosis" or "ICU syndrome", terms largely abandoned for the more widely accepted term ICU delirium. Since the advent of validated and easy-to-implement delirium instruments for ICU patients such as the Confusion Assessment Method for the ICU (CAM-ICU) and the Intensive Care Delirium Screening Checkllist (IC-DSC)., of the hundreds of thousands of ICU patients who develop delirium in ICUs every year, it has been recognized that most of them belong to the hypoactive variety, which is easily missed and invisible to the managing teams unless actively monitored using such instruments. The causes of delirium in such patients depend on the underlying illnesses, new problems like sepsis and low oxygen levels, and the sedative and pain medicines that are nearly universally given to all ICU patients. Outside the ICU, on hospital wards and in nursing homes, the problem of delirium is also a very important medical problem, especially for older patients. ↑ Clegg, A; Young, JB (January 2011). "Which medications to avoid in people at risk of delirium: a systematic review". Age and ageing. 40 (1): 23–9. doi:10.1093/ageing/afq140. PMID 21068014. ↑ Gleason OC (March 2003). "Delirium". Am Fam Physician. 67 (5): 1027–34. PMID 12643363. 1 2 3 4 5 6 Siddiqi, Najma; Harrison, Jennifer K.; Clegg, Andrew; Teale, Elizabeth A.; Young, John; Taylor, James; Simpkins, Samantha A. (2016-03-11). "Interventions for preventing delirium in hospitalised non-ICU patients". The Cochrane Database of Systematic Reviews. 3: CD005563. doi:10.1002/14651858.CD005563.pub3. ISSN 1469-493X. PMID 26967259. ↑ Ely EW; Shintani A; Truman B; et al. (2004). "Delirium as a predictor of mortality in mechanically ventilated patients in the intensive care unit". JAMA. 291 (14): 1753–62. doi:10.1001/jama.291.14.1753. PMID 15082703. 1 2 Neufeld, KJ; Yue, J; Robinson, TN; Inouye, SK; Needham, DM (April 2016). "Antipsychotic Medication for Prevention and Treatment of Delirium in Hospitalized Adults: A Systematic Review and Meta-Analysis.". Journal of the American Geriatrics Society. 64 (4): 705–14. doi:10.1111/jgs.14076. PMID 27004732. ↑ Attard A, Ranjith G, Taylor D (August 2008). 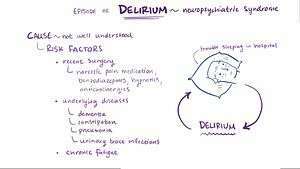 "Delirium and its treatment". CNS Drugs. 22 (8): 631–44. doi:10.2165/00023210-200822080-00002. PMID 18601302. ↑ de Rooij, SE; Schuurmans, MJ; van der Mast, RC; Levi, M (July 2005). "Clinical subtypes of delirium and their relevance for daily clinical practice: a systematic review.". International journal of geriatric psychiatry. 20 (7): 609–15. doi:10.1002/gps.1343. PMID 16021665. ↑ Meagher, D (February 2009). "Motor subtypes of delirium: past, present and future.". International review of psychiatry (Abingdon, England). 21 (1): 59–73. doi:10.1080/09540260802675460. PMID 19219713. ↑ Leentjens, AF; Rundell, J; Rummans, T; Shim, JJ; Oldham, R; Peterson, L; Philbrick, K; Soellner, W; Wolcott, D; Freudenreich, O (August 2012). "Delirium: An evidence-based medicine (EBM) monograph for psychosomatic medicine practice, commissioned by the Academy of Psychosomatic Medicine (APM) and the European Association of Consultation Liaison Psychiatry and Psychosomatics (EACLPP).". Journal of psychosomatic research. 73 (2): 149–52. doi:10.1016/j.jpsychores.2012.05.009. PMID 22789420. ↑ Cole, MG; Ciampi, A; Belzile, E; Zhong, L (January 2009). "Persistent delirium in older hospital patients: a systematic review of frequency and prognosis.". Age and ageing. 38 (1): 19–26. doi:10.1093/ageing/afn253. PMID 19017678. ↑ Jackson, JC; Mitchell, N; Hopkins, RO (July 2009). "Cognitive functioning, mental health, and quality of life in ICU survivors: an overview.". Critical Care Clinics. 25 (3): 615–28, x. doi:10.1016/j.ccc.2009.04.005. PMID 19576534. ↑ Hopkins, RO; Jackson, JC (September 2006). "Long-term neurocognitive function after critical illness.". Chest. 130 (3): 869–78. doi:10.1378/chest.130.3.869. PMID 16963688. ↑ Inouye, SK; Bogardus Jr., ST; Charpentier, PA; Leo-Summers, L; Acampora, D; Holford, TR; Cooney Jr., LM (Mar 4, 1999). "A multicomponent intervention to prevent delirium in hospitalized older patients.". The New England Journal of Medicine. 340 (9): 669–76. doi:10.1056/NEJM199903043400901. PMID 10053175. ↑ Hshieh, TT; Fong, TG; Marcantonio, ER; Inouye, SK (July 2008). "Cholinergic deficiency hypothesis in delirium: a synthesis of current evidence.". The journals of gerontology. Series A, Biological sciences and medical sciences. 63 (7): 764–72. doi:10.1093/gerona/63.7.764. PMC 2917793 . PMID 18693233. 1 2 Cunningham, C; Maclullich, AM (Aug 3, 2012). "At the extreme end of the psychoneuroimmunological spectrum: Delirium as a maladaptive sickness behaviour response.". Brain, behavior, and immunity. 28: 1–13. doi:10.1016/j.bbi.2012.07.012. PMID 22884900. ↑ Hall, RJ; Shenkin, SD; Maclullich, AM (2011). "A systematic literature review of cerebrospinal fluid biomarkers in delirium.". Dementia and geriatric cognitive disorders. 32 (2): 79–93. doi:10.1159/000330757. PMID 21876357. ↑ Witlox, J; Kalisvaart, KJ; de Jonghe, JF; Verwey, NA; van Stijn, MF; Houdijk, AP; Traast, HS; MacLullich, AM; van Gool, WA; Eikelenboom, P (July 2011). "Cerebrospinal fluid β-amyloid and tau are not associated with risk of delirium: a prospective cohort study in older adults with hip fracture.". Journal of the American Geriatrics Society. 59 (7): 1260–7. doi:10.1111/j.1532-5415.2011.03482.x. PMID 21718268. ↑ Soiza, RL; Sharma, V; Ferguson, K; Shenkin, SD; Seymour, DG; Maclullich, AM (September 2008). "Neuroimaging studies of delirium: a systematic review.". Journal of psychosomatic research. 65 (3): 239–48. doi:10.1016/j.jpsychores.2008.05.021. PMID 18707946. ↑ Gunther, ML; Morandi, A; Krauskopf, E; Pandharipande, P; Girard, TD; Jackson, JC; Thompson, J; Shintani, AK; Geevarghese, S; Miller III, RR; Canonico, A; Merkle, K; Cannistraci, CJ; Rogers, BP; Gatenby, JC; Heckers, S; Gore, JC; Hopkins, RO; Ely, EW; for the VISIONS Investigation (VISualizing Icu SurvivOrs Neuroradiological Sequelae) (July 2012). "The association between brain volumes, delirium duration, and cognitive outcomes in intensive care unit survivors: the VISIONS cohort magnetic resonance imaging study*". Critical Care Medicine. 40 (7): 2022–32. doi:10.1097/ccm.0b013e318250acc0. ↑ Morandi, A; Rogers, BP; Gunther, ML; Merkle, K; Pandharipande, P; Girard, TD; Jackson, JC; Thompson, J; Shintani, AK; Geevarghese, S; Miller III, RR; Canonico, A; Cannistraci, CJ; Gore, JC; Ely, EW; Hopkins, RO; for the VISIONS Investigation (VISualizing Icu SurvivOrs Neuroradiological Sequelae) (July 2012). "The relationship between delirium duration, white matter integrity, and cognitive impairment in intensive care unit survivors as determined by diffusion tensor imaging: the VISIONS prospective cohort magnetic resonance imaging study*.". Critical Care Medicine. 40 (7): 2182–9. doi:10.1097/CCM.0b013e318250acdc. PMID 22584766. ↑ Hatano, Y; Narumoto, J; Shibata, K; Matsuoka, T; Taniguchi, S; Hata, Y; Yamada, K; Yaku, H; Fukui, K (Sep 21, 2012). "White-Matter Hyperintensities Predict Delirium After Cardiac Surgery.". The American Journal of Geriatric Psychiatry: 1. doi:10.1097/JGP.0b013e31826d6b10. PMID 23000936. ↑ Shioiri, A; Kurumaji, A; Takeuchi, T; Matsuda, H; Arai, H; Nishikawa, T (August 2010). "White matter abnormalities as a risk factor for postoperative delirium revealed by diffusion tensor imaging.". The American Journal of Geriatric Psychiatry. 18 (8): 743–53. doi:10.1097/JGP.0b013e3181d145c5. PMID 20220599. ↑ Choi, SH; Lee, H; Chung, TS; Park, KM; Jung, YC; Kim, SI; Kim, JJ (May 2012). "Neural network functional connectivity during and after an episode of delirium.". The American Journal of Psychiatry. 169 (5): 498–507. doi:10.1176/appi.ajp.2012.11060976. PMID 22549209. ↑ Engel, GL; Romano, J (Fall 2004). "Delirium, a syndrome of cerebral insufficiency. 1959.". The Journal of neuropsychiatry and clinical neurosciences. 16 (4): 526–38. doi:10.1176/appi.neuropsych.16.4.526. PMID 15616182. ↑ van der Kooi, AW; Leijten, FS; van der Wekken, RJ; Slooter, AJ (Fall 2012). "What are the opportunities for EEG-based monitoring of delirium in the ICU?". The Journal of neuropsychiatry and clinical neurosciences. 24 (4): 472–7. doi:10.1176/appi.neuropsych.11110347. PMID 23224454. ↑ Janz, DR; Abel, TW; Jackson, JC; Gunther, ML; Heckers, S; Ely, EW (September 2010). "Brain autopsy findings in intensive care unit patients previously suffering from delirium: a pilot study.". Journal of critical care. 25 (3): 538.e7–12. doi:10.1016/j.jcrc.2010.05.004. PMID 20580199. ↑ Munster, BC; Aronica, E; Zwinderman, AH; Eikelenboom, P; Cunningham, C; Rooij, SE (December 2011). "Neuroinflammation in delirium: a postmortem case-control study.". Rejuvenation research. 14 (6): 615–22. doi:10.1089/rej.2011.1185. PMID 21978081. ↑ Bellelli, G.; Nobili, A.; Annoni, G.; Morandi, A.; Djade, C. D.; Meagher, D. J.; Maclullich, A. M. J.; Davis, D.; Mazzone, A. (2015-08-31). "Under-detection of delirium and impact of neurocognitive deficits on in-hospital mortality among acute geriatric and medical wards". European Journal of Internal Medicine. 26: 696–704. doi:10.1016/j.ejim.2015.08.006. ISSN 1879-0828. PMID 26333532. ↑ Schuurmans, Marieke J.; Shortridge-Baggett, Lillie M.; Duursma, Sijmen A. (2003-01-01). "The Delirium Observation Screening Scale: a screening instrument for delirium". Research and Theory for Nursing Practice. 17 (1): 31–50. doi:10.1891/rtnp.17.1.31.53169. ISSN 1541-6577. PMID 12751884. ↑ Gaudreau, Jean-David; Gagnon, Pierre; Harel, François; Tremblay, Annie; Roy, Marc-André (2005-04-01). "Fast, systematic, and continuous delirium assessment in hospitalized patients: the nursing delirium screening scale". Journal of Pain and Symptom Management. 29 (4): 368–375. doi:10.1016/j.jpainsymman.2004.07.009. ISSN 0885-3924. PMID 15857740. ↑ Inouye, S. K.; van Dyck, C. H.; Alessi, C. A.; Balkin, S.; Siegal, A. P.; Horwitz, R. I. (1990-12-15). "Clarifying confusion: the confusion assessment method. A new method for detection of delirium". Annals of Internal Medicine. 113 (12): 941–948. doi:10.7326/0003-4819-113-12-941. ISSN 0003-4819. PMID 2240918. ↑ Voyer, Philippe; Champoux, Nathalie; Desrosiers, Johanne; Landreville, Philippe; McCusker, Jane; Monette, Johanne; Savoie, Maryse; Richard, Sylvie; Carmichael, Pierre-Hugues (2015-01-01). "Recognizing acute delirium as part of your routine [RADAR]: a validation study". BMC nursing. 14: 19. doi:10.1186/s12912-015-0070-1. ISSN 1472-6955. PMC 4384313 . PMID 25844067. ↑ Bellelli, Giuseppe; Morandi, Alessandro; Davis, Daniel H. J.; Mazzola, Paolo; Turco, Renato; Gentile, Simona; Ryan, Tracy; Cash, Helen; Guerini, Fabio (2014-07-01). "Validation of the 4AT, a new instrument for rapid delirium screening: a study in 234 hospitalised older people". Age and Ageing. 43 (4): 496–502. doi:10.1093/ageing/afu021. ISSN 1468-2834. PMC 4066613 . PMID 24590568. 1 2 Ely EW; Inouye SK; Bernard GR; et al. (December 2001). "Delirium in mechanically ventilated patients: validity and reliability of the confusion assessment method for the intensive care unit (CAM-ICU)". JAMA. 286 (21): 2703–10. doi:10.1001/jama.286.21.2703. PMID 11730446. 1 2 Bergeron N, Dubois MJ, Dumont M, Dial S, Skrobik Y (May 2001). "Intensive Care Delirium Screening Checklist: evaluation of a new screening tool". Intensive Care Med. 27 (5): 859–64. doi:10.1007/s001340100909. PMID 11430542. 1 2 3 Ely, E.W. ; et al. "ICU Delirium and Cognitive Impairment Study Group". Retrieved 6 December 2012. ↑ Jones, SF; Pisani, MA (April 2012). "ICU delirium: an update.". Current opinion in critical care. 18 (2): 146–51. doi:10.1097/MCC.0b013e32835132b9. PMID 22322260. ↑ EW Ely (March 2014). "Confusion Assessment Method for the ICU (CAM-ICU): The Complete Training Manual." (PDF). ICU Delirium. pp. 1–32. Retrieved October 25, 2016. 1 2 3 4 5 6 7 8 National Institute for Health and Clinical Excellence. Clinical guideline 103: Delirium. London, 2010. 1 2 3 4 5 6 7 8 9 Inouye SK (March 2006). "Delirium in older persons". N. Engl. J. Med. 354 (11): 1157–65. doi:10.1056/NEJMra052321. PMID 16540616. ↑ Boltz, Marie; Capezuti, Elizabeth; Fulmer, Terry T.; Zwicker, DeAnne, eds. (2011). Evidence-based geriatric nursing protocols for best practice (4th ed.). New York, NY: Springer Publishing Co. ISBN 9780826171283. ↑ Martinez, F; Tobar, C; Hill, N (March 2015). "Preventing delirium: should non-pharmacological, multicomponent interventions be used? A systematic review and meta-analysis of the literature.". Age and ageing. 44 (2): 196–204. doi:10.1093/ageing/afu173. PMID 25424450. ↑ "Pharmacologic prevention of postoperative delirium.". Z Gerontol Geriatr. 47: 105–9. Feb 2014. doi:10.1007/s00391-013-0598-1. PMID 24619041. 1 2 3 4 5 6 Flaherty, J.; Little, M. (2011). "Matching the Environment to Patients with Delirium: Lessons Learned from the Delirium Room, a Restraint-Free Environment for Older Hospitalized Adults with Delirium". Journal of the American Geriatrics Society. 59: 295–300. doi:10.1111/j.1532-5415.2011.03678.x. ↑ Young, J.; Inouye, S. (2007). "Delirium in older people". British Medical Journal. 334 (7598): 842–846. doi:10.1136/bmj.39169.706574.AD. PMC 1853193 . PMID 17446616. ↑ Tyrer, Peter; Silk, Kenneth R., eds. (24 January 2008). "Delirium". Cambridge Textbook of Effective Treatments in Psychiatry (1st ed.). Cambridge University Press. pp. 175–184. ISBN 978-0-521-84228-0. 1 2 3 4 Witlox, J; Eurelings, LS; de Jonghe, JF; Kalisvaart, KJ; Eikelenboom, P; van Gool, WA (Jul 28, 2010). "Delirium in elderly patients and the risk of postdischarge mortality, institutionalization, and dementia: a meta-analysis.". JAMA: The Journal of the American Medical Association. 304 (4): 443–51. doi:10.1001/jama.2010.1013. PMID 20664045. 1 2 3 Davis, DH; Muniz Terrera, G; Keage, H; Rahkonen, T; Oinas, M; Matthews, FE; Cunningham, C; Polvikoski, T; Sulkava, R; MacLullich, AM; Brayne, C (September 2012). "Delirium is a strong risk factor for dementia in the oldest-old: a population-based cohort study.". Brain : a journal of neurology. 135 (Pt 9): 2809–16. doi:10.1093/brain/aws190. PMC 3437024 . PMID 22879644. ↑ Iwashyna, TJ; Ely, EW; Smith, DM; Langa, KM (Oct 27, 2010). "Long-term cognitive impairment and functional disability among survivors of severe sepsis.". JAMA: The Journal of the American Medical Association. 304 (16): 1787–94. doi:10.1001/jama.2010.1553. PMC 3345288 . PMID 20978258. 1 2 Ehlenbach, WJ; Hough, CL; Crane, PK; Haneuse, SJ; Carson, SS; Curtis, JR; Larson, EB (Feb 24, 2010). "Association between acute care and critical illness hospitalization and cognitive function in older adults.". JAMA: The Journal of the American Medical Association. 303 (8): 763–70. doi:10.1001/jama.2010.167. PMC 2943865 . PMID 20179286. ↑ Wilson, RS; Hebert, LE; Scherr, PA; Dong, X; Leurgens, SE; Evans, DA (Mar 27, 2012). "Cognitive decline after hospitalization in a community population of older persons.". Neurology. 78 (13): 950–6. doi:10.1212/WNL.0b013e31824d5894. PMID 22442434. ↑ Fong, TG; Jones, RN; Shi, P; Marcantonio, ER; Yap, L; Rudolph, JL; Yang, FM; Kiely, DK; Inouye, SK (May 5, 2009). "Delirium accelerates cognitive decline in Alzheimer disease.". Neurology. 72 (18): 1570–5. doi:10.1212/WNL.0b013e3181a4129a. PMC 2677515 . PMID 19414723. 1 2 3 Canadian Coalition for Seniors' Mental Health (2006). National Guidelines for Seniors' Mental Health: The Assessment and Treatment of Delirium. Canadian Coalition for Seniors' Mental Health. ↑ Siddiqi, N.; House, AO; Holmes, JD (30 June 2006). "Occurrence and outcome of delirium in medical in-patients: a systematic literature review". Age and Ageing. 35 (4): 350–364. doi:10.1093/ageing/afl005. PMID 16648149. ↑ Voyer, Philippe; Richard, Sylvie; Doucet, Lise; Carmichael, Pierre-Hugues (2009). "Detecting Delirium and Subsyndromal Delirium Using Different Diagnostic Criteria among Demented Long-Term Care Residents". Journal of the American Medical Directors Association. 10 (3): 181–188. doi:10.1016/j.jamda.2008.09.006. ↑ Berrios GE (November 1981). "Delirium and confusion in the 19th century: a conceptual history". Br J Psychiatry. 139 (5): 439–49. doi:10.1192/bjp.139.5.439. PMID 7037094. ↑ Leslie, DL; Marcantonio, ER; Zhang, Y; Leo-Summers, L; Inouye, SK (Jan 14, 2008). "One-year health care costs associated with delirium in the elderly population.". Archives of Internal Medicine. 168 (1): 27–32. doi:10.1001/archinternmed.2007.4. PMID 18195192. ↑ Akunne, A; Murthy, L; Young, J (May 2012). "Cost-effectiveness of multi-component interventions to prevent delirium in older people admitted to medical wards.". Age and ageing. 41 (3): 285–91. doi:10.1093/ageing/afr147. PMID 22282171. Grassi, Luigi; Caraceni, Augusto (2003). Delirium: acute confusional states in palliative medicine. Oxford: Oxford University Press. ISBN 0192631993. Newman, James K.; Slater, Christopher T., eds. (2012). Delirium: causes, diagnosis and treatment. Hauppauge, N.Y.: Nova Science Publisher's, Inc. ISBN 978-1613242940. Wikisource has the text of the 1911 Encyclopædia Britannica article Delirium .